The Photonics Division of Thermo Electron Corporation consists of eight business units that design, manufacture, and market photonics components and products. The Thermo Photonics businesses address all six market segments of the photonics industry: optical components, imaging sensors and systems, lasers, optical instruments, optoelectronics, and fiber optics. And we are among the worldwide leaders in each of these segments. Our primary business is to OEM accounts. We offer different levels of products and services depending on the needs of each customer. Each of the eight Thermo Electron Photonics businesses possesses world-class expertise in their specialty. Each business achieved leadership by delivering quality products that are on-target and on time. Our reputation rests solidly on customer satisfaction. As an alliance of eight businesses producing such a wide range of photonics products plus outsourcing, we can supply mounted and/or assembled components or the entire instrument. The choice is yours. With our optoelectronic and optomechanical engineering expertise, we assist our customers on a confidential basis in optimizing system design and in the incorporation of our components. We invite you to tap this wide-ranging expertise in the design of your next product. 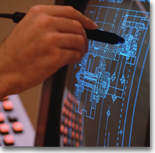 We employ modern CAD and modeling systems to shorten design cycles and efficiently move new products into production. Our production facilities employ current-art materials control systems and ISO-9000 registered or ISO-9000 like quality systems. Our teams will work with your product development, production, and purchasing departments to devise the best solution for you. We feel that our broad range of products, their quality and reliability, and our partnering relationship with our customers make us the ideal one-stop OEM photonics supplier for you. To learn more, click on business names below to go to individual Web sites. Contact one business and the expertise of the others will be brought to bear on your solution as appropriate. We look forward to working with you. Thermo Corion designs and manufactures optical interference bandpass filters, image quality filters, fluorescence filters, heat rejection filters, edge filters, dichroic filters and beamsplitters. Major OEM customers are producers of instruments for the biomedical, analytical, process and quality control markets. Thermo Hilger Crystals produces a variety of electro-optic and photo refractive crystals for use as frequency doublers, parametric oscillators, and photo refractive elements. The business also grows and polishes synthetic crystals such as NaCl, KCl, KBr, KI, and CsI used in infrared optics and produces scintillation crystals for radiation detection applications. Hilger Crystals Ltd. is an OEM supplier to manufacturers of scientific instruments and X-ray baggage inspection systems. 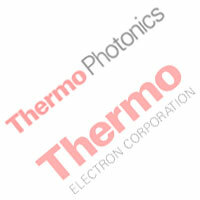 Thermo Oriel designs and manufactures over 4000 photonics components and instruments to make, move, and measure light. These include light sources, lasers, monochromators and spectrographs, detectors and detection systems, fiber optics, micropositioning equipment, optical mounts, microscope objectives, retro-reflectors, and replicated optics. The information rich Oriel Book of Photonic Tools is a favorite with design engineers. Thermo RGL is a world leader in the design and manufacture of ruled and holographic diffraction gratings for use from the far ultraviolet through the visible and into the infrared. The company provides gratings to the telecommunications industry for DWDM components and channel monitoring equipment, manufacturers of spectroscopic instrumentation and excimer lasers, as well as to scientific researchers and astronomers around the world. Thermo Assembly & Test provides contract assembly, complete outsourcing for printed circuit boards, harness and cable, electromechanical and opticalmechnical subassembly, and/or complete instruments. To learn more about our parent organization, click on the link to Thermo Electron Corporation .